I want to pose a simple question here, how many blocks do you see, 4 or 3? Some might answer 4 and some 3, so what is the reality? It is really confusing. All of us have heard the saying that what you see is what you get. 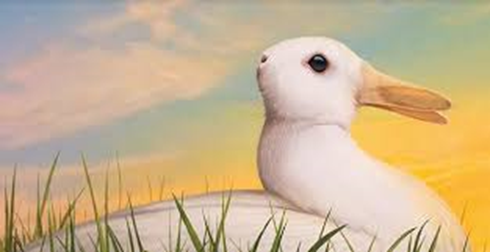 But the reality might be different, how can be it be ascertained and is there such a thing as absolute reality. So if everything is relative, are we making some serious errors? 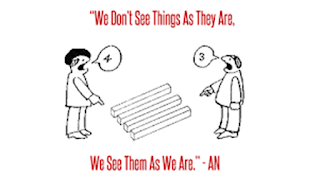 As it influences our behavior and if our perception changes our behavior also does. The reality might be totally opposite to our perception. It has also been observed by the novelist, Roberto Bolano and he says, “People see what they want to see and what people want to see has nothing to do with the truth”. 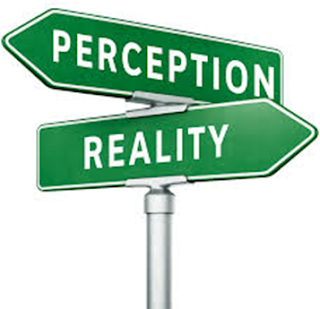 So what we can conclude is if our perception gives us wrong results then our behavior which is based on our perception might be erroneous. Let us look at a real story. “This actually did happen to a real person, and the real person is me. I had gone to catch a train. This was April 1976, in Cambridge, UK. I was a bit early for the train. I’d gotten the time of the train wrong. I went to get myself a newspaper to do the crossword, and a cup of coffee and a packet of cookies. I went and sat at a table. I want you to picture the scene. It’s very important that you get this very clear in your mind. Here’s the table, newspaper, cup of coffee, packet of cookies. There’s a guy sitting opposite me, perfectly ordinary-looking guy wearing a business suit, carrying a briefcase. It didn’t look like he was going to do anything weird. What he did was this: he suddenly leaned across, picked up the packet of cookies, tore it open, took one out, and ate it. Now this, I have to say, is the sort of thing the British are very bad at dealing with. There’s nothing in our background, upbringing, or education that teaches you how to deal with someone who in broad daylight has just stolen your cookies. You know what would happen if this had been South Central Los Angeles. There would have very quickly been gunfire, helicopters coming in, CNN, you know…But in the end, I did what any red-blooded Englishman would do: I ignored it. And I stared at the newspaper, took a sip of coffee, tried to do a clue in the newspaper, couldn’t do anything, and thought what am I going to do? In the end I thought nothing for it, I’ll just have to go for it, and I tried very hard not to notice the fact that the packet was already mysteriously opened. I took out a cookie for myself. I thought that should settle him. But it hadn’t because a moment or two later he did it again. He took another cookie. Having not mentioned it the first time, it was somehow even harder to raise the subject the second time around. “Excuse me, I couldn’t help but notice…” I mean, it doesn’t really work. All of us get the point, I believe, our perceptions fool us most of the time. DEEPER QUESTION: Is it important to know the Reality Absolutely or It is OK if we have the relative view of the Reality and base our behavior on that. STILL DEEPER QUESTION: Is there ANY such thing as ABSOLUTE REALITY? The vibrant e –market in India has witnessed great volatility in the past few months. With numerous Indian players competing against each other and with foreign players in the fray, each player is vying for a substantial share of the market. According to Forrester Research, the online retail market in India is only 2% of total retail sales. The market is expected to rise at a compound annual growth rate (CAGR) of 44% to reach $ 75 billion by 2020. Analysts believe that all the permutations and combinations are being worked out: from changing business models to strategic alliances to broadening of the product spectrum. According to a report by ASSOCHAM, logistics and infrastructure in e-retailing becomes the very backbone of the fulfillment network and the basis on which stringent service level expectations are set and met, and customer mind-space among competing alternatives is won. In India, these are arguably the weakest links, and therefore the enhanced need for greater attention and management of these critical functions becomes imperative. It is to be noted that each product category has its own customized logistics requirements which can alter the balance between inventory and supply chain costs. As a logical consequence to the foregoing thought process, Flipkart is growing its logistics arm E-Kart whereas Amazon India is building capacities with its logistic arm Amazon Logistics. In addition, Flipkart is also working towards an inventory based model on the lines of Amazon. Amazon, on the other hand, is parternering with local stores, thereby reducing its inventory holding costs. Consequently, the increased sales indicate a win- win situation, for the web store, the concerned brick and mortar store as well as the customer. Flipkart has been working tirelessly to bring about a radical change in its business domain. With the launch of ‘Billion’, a private brand from the Flipkart stable,it is attempting local innovations to cater to the specific needs of the Indian masses. Amazon on the other hand is attempting to widen its product offerings by entering into the grocery domain. This move is bound to affect the market share of the local players like Big –Basket, Grofers etc. 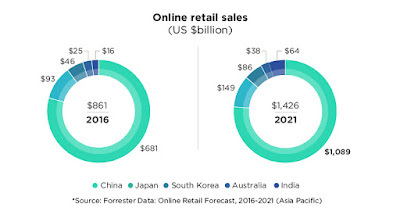 According to a study by Forrester Research, Asia Pacific continues to be the largest region for online retail sales. Their data shows that with $681 billion in online retail sales in 2016, China is the largest market for e-commerce globally, followed by the US; but it is India that is the fastest-growing e-commerce market. Thus we may conclude that there are a plethora of offerings in each market segment in the online marketplace in India. With the innovative strategies and widening product ranges, the e-stores have a lot to offer. The pricing strategies of the different players need to be carefully examined to derive the best quality products as a customer. Living in a corrupt nation, since a long time demonetization was a huge step by our Prime Minister Shri Narendra Modi. The process of changing national currency where old currency was replaced with the new currency has created a lot of havoc in the country. The system of demonetization has lead to various impacts on the economy, positive as well as negative. There have been many positive impacts like: - the use of fake currency was eradicated. The problem of corruption has been tackled up to a large amount. Moreover, digital payment modes have been given a drastic push to reach the target of a cashless society. Due to demonetization, many illegal activities have been avoided. The government also encourages the payment of taxes after demonetization. With these benefits, demonization also brought many inconveniences to the public. There was a reduction in sales, especially cash based sales. The business activities were disrupted leading to a huge economic loss to the nation. Additional costs were incurred due to distribution and printing of new currency the main victims were the small businessmen as they usually dealt on the cash basis. Cash is the most preferred mode of payment globally due to the ease of accessibility, its certainty of acceptance, efficiency and no additional charges make it a preferable mode of payment. Demonetization of high denomination notes (Of Rs. 500 and Rs. 1000) has put over most of the currency out of the circulation. This has resulted in short term disruptions in transactions in agriculture and related sectors, small establishments, households and among professionals. Since the injection of liquidity became slow, incomes in both the formal and informal sectors have been affected to a greater extent. The incomes of the casual workers and self employed suffered a huge setback as they dominate in the overall economy. The E-commerce industry, after some months of demonetization, did see a decline in India as there was a reduction in sales. The cash crunch and reductions on the ATM withdrawals affected the buying capacity of the majority of consumers especially the ones who used the cash on delivery method. Some of the online retailers had to temporarily suspend their COD payment option. Though in the beginning demonetization has brought a sudden decline in the E-commerce industry, the first quarter of 2017 brought has positive changes. Online money and digital payments are not as difficult as they were before. This makes it easy for the public to smartly tackle the sudden ban on the old currency. Flipkart, Amazon, Snapdeal and many other online shopping sites are ruling the retail segment. These E-commerce sites, however, took an unplanned spike in their revenue soon after demonetization. With the minimal cash dependence across industries, there has been a lot of IT adoption. IT industry has been positively affected by this change and has seen a huge boost due to this move. As the country is moving towards the more cashless way of transacting like Paytm and Mobikwik, online banking and E-commerce will see an increased demand in the near future. This particularly will benefit IT start-ups that work on online payments. Government initiatives as such as aadhar, jandhan will nudge a lot of fintech companies to enable financial institutions and banks to adopt these facilities. With cash transactions facing a sharp reduction, it leads to many alternative forms of payments like online debit/credit card transactions. Many companies will realize the need for IT systems to enable the ease of online transactions for its customers, giving IT companies many opportunities. Although India came to a standstill after the introduction of demonetization, now it is trying to a great extent to overcome the negatives of the scheme. Hence the GDP of the economy, the IT as well as E-commerce industry has gone through a greater hike after the implementation of the demonetization. The meaning of "digital literacy" has shifted over the years. While there was a time when job candidates were encouraged to list "Proficient at Microsoft Word" on their resume, now such skills are considered standard. This shift toward a technologically savvy workforce has permeated the classroom as well. It makes sense to assume that the more digitally literate our educators are, the more they'll employ these skills in the classroom, which will in turn foster a strong sense of digital citizenship in our students. However, the importance and scope of digital literacy extends beyond this simple theory. Here, we've laid out reasons why digital literacy skills are important for today's educators. Good educators know how their students engage and learn and can use that knowledge to push for technology that will unlock new teaching potential. This makes digitally literate educators great advocates for the appropriate technologies. These skills become increasingly important in diverse classrooms in which students are bringing different cultural contexts into the mix. Both the content and the technologies chosen may vary in effectiveness given a student’s familiarity with the tools and the various norms within their culture. While the technology created may be sound, whether or not it’s actually relevant to the classroom is debatable. And since educators aren’t regularly consulted to see what tech solutions they need for their classrooms, there are a wealth of potential products that are never made in the first place. Students with access to a computer and the Internet are able to find the answers to not only simple questions, but also incredibly complex problems. However, there is a significant difference between Googling an answer and understanding why. Simply Googling an answer does not provide students with true, exact, deep learning. And while most students understand how to use a search engine, it is up to educators to provide students with the additional skills to bring the answers to the next level. Teach students to evaluate and question their sources. Students need to know the difference between a reliable and unreliable source. How many other sites link to this source as a reference? Is the information presented in objective or biased language? Teach students how to draw a strong conclusion. Sure, students might find the right answer to a problem, but what use is that search if they’ve only memorized the logic to get them there? It’s up to educators to teach that logic and to contextualize the answer. Encourage students to new levels of creativity. Once students have a deeper understanding of the answers they’ve found, push for creative application of that knowledge. This could be anything from challenging students to pose related questions to having students use other digital platforms to create something new. Students in schools struggle to take advantage of the tools, platforms, apps and resources available to their connected peers. But this digital divide isn’t just in schools — there is also a lack of access to devices and broadband at home. The divide is pervasive and accentuates already destructive achievement gaps. Digitally literate educators advocate for change and seek innovative solutions. Being a good digital citizen means understanding and applying appropriate and responsible uses of internet and technology. Two issues top the list when it comes to digital citizenship: academic plagiarism and cyber bullying. In a culture where students are constantly sharing content, they may not know what plagiarism is, let alone when they’re doing it. Educators should set clear anti-plagiarism policies at the beginning of each year. Is that takes place through the use of electronic technology, and is a pervasive issue in schools and online communities. And while today’s students may be digital natives, they still need to be taught that social norms apply to online behavior. Resources should be in place to prevent cyberbullying and to help students who are being bullied. While students may be adept at using digital tools, their understanding of what these tools can do is often limited. Students use Facebook to post photos but don’t think to use the platform for art or history projects. They record themselves with a voice memo app but do not realize those apps could also be used for journalism projects or a historical narrative piece. Digitally literate educators know how to inspire students to use today's technology as a powerful toolset to expand their learning opportunities. It is essential to meeting the needs of all learners, but it is time-consuming, especially for new educators. Technology, when used creatively and correctly, can be used to mitigate those differences, such as in one-to-one classrooms. Educators can lead the class through a lecture, while visual learners follow along with illustrations on their tablets and audio learners record the lecture for later review. Technology like this enables educators to give their students choice in the kind of work they create for projects, such as a video, podcast or written story. Digital literacy is required in order to set the standards and boundaries for this kind of differentiation. The GST is an improvement towards comprehensive tax reforms in the country that would give India a world class taxation system which would improve tax collection by integration of goods and services taxation. It would end differential treatments of manufacturing and services sector. It will replace various taxes such as Octroi, Central Sales Tax, State level Sales Tax, Entry Tax, Stamp Duty, telecom license fees, turnover tax, tax on consumption or sale of electricity, etc. GST is expected to create a business friendly environment by stabilizing price levels. Inflation rates would also come down overtime as a uniform tax rate is applied. It will also improve government's fiscal health as the tax collection system would become more transparent, making tax evasion difficult. The GST at the central and at the state level will thus give more relief to the industry, trade, agriculture and consumers through a more comprehensive and wider coverage of input tax set off and service tax set off. Also inclusion of several taxes in the GST and phasing out of CST will help remove the shortcomings of VAT. 1. Consumers will be required to pay more taxes on the goods consumed or services availed by them as the GST has been levied on the daily necessities as well, though the rate of tax aries. 2. Small Traders are protesting against the application of Goods and Services Tax because it would increase the compliance cost for them resulting in increase in the prices of goods and services for consumers. 1. The impact of GST on macroeconomic indicators are expected to be positive, Inflation Rate would go down as cascading effect of tax would be removed. 2. Implementation of GST would result in decrease in the value of goods and services over a period of time which will make our exports more competitive in the world economy and it will also result in increased FDI inflow in the country. 3. It will make the taxation system more transparent and simple and easy to understand. 4. Since GST is not levied on goods and services which are exported so it provides an incentive to EOUs, SEZs and EPZs to export more. And as far as imports are concerned, GST will be levied on goods or services imported into the country with destination principle where the imported goods or services are consumed that state will enjoy the tax revenue. 5. The normal taxation rate on organizations will fall which will decrease the overall cost of Indian goods and services and make them competitive in the global market and ultimately boost GDP. Hadoop distributed File System (HDFS) which is an open source implementation of the GoogleFile System (GFS) for storing data. IN HDFS, data file is divided into blocks and copies of these blocks are stored on other servers in the Hadoop cluster. The default block size is 64 MB. This redundancy offers high availability. A Higher Block size is recommended as it requires less metadata by the NameNode. Each data block is stored by default on three different servers; in Hadoop, this is implemented by HDFS working behind the scenes to make sure at least two blocks are stored on a separate server rack to improve reliability in the event you lose an entire rack of servers. All of Hadoop data placement logic is managed by a special server called NameNode. This NameNode server keeps tracks of all the data files in HDFS, such as where the blocks are stored and more. NameNode is stored inside the memory for quick response. Hadoop works on servers available in very large cluster. MapReduce tries to assign workloads to these servers where the data to be processed is stored, this is known as data locality. . When a Hadoop Job is fired and the application has to read data and starts to work on the programmed MapReduce tasks, Hadoop will contact the NameNode, find the servers that hold the parts of the data that need to be accessed to carry out the job and then send your application to run locally on those nodes. MapReduce is two distinct jobs. The first is map job, which takes a set of data and converts it into another set of data, where individual elements are broken down into tuples (key/value pairs). The reduce job takes the output from a map as input and combines those data tuples into a smaller set of tuples. The Hadoop Common is the base/core of the Hadoop framework, as it provides essential services and basic processes such as abstraction of the underlying operating system and its file system. Hadoop Common also contains the necessary Java Archive (JAR) files and scripts required to start Hadoop. The Hadoop Common package also provides source code and documentation, as well as a contribution section that includes different projects from the Hadoop Community. YARN stands for (Yet Another Resource Negotiator) is a cluster management solution. YARN is present in the Hadoop 2.0 and works as a resource manager with duty of assigning resources to the operations. YARN works above the HDFS layer and all other Hadoop systems like Pig, Hive, Hbase and Spark etc. uses the services of YARN to access HDFS and underling Hardware. The YARN increases the performance of Hadoop in the following ways Multi-tenancy , cluster utilization, scalability and compatibility. Pig: Pig was initially developed at Yahoo to focus more on analyzing large data sets and spend less time on map reduce programs. Pig can handle any data types. FLUME : Flume is an Apache Project. It allow you to flow data from a source into your Hadoop environment. ZOOKEEPER : It is an Apache project that provides a centralized infrastructure and services that enables synchronization across a cluster. Hbase : It is an column oriented database management system that runs on top of HDFS. It is well suited for sparse data sets, which are common in many Big Data use cases. HBase does not support SQL. HBase application are written in java. As per the agile manifesto the main focus is to develop working software with only comprehensive documentation. But sometimes due to managerial or organizational issues, customer or project requires some standards to be followed. And for standard conformance generation of documentation is essential. As proper documentation is not there, hence at times proper quality is not ensured. In agile methods, the customer is involved in all the phases. The continuous interaction with the customer is a positive value to product quality. The developer is the one who continuously interacts with the customer. As the developer got the technical background, hence at times the customer may not able to understand the developer’s point of view which can further lead to misunderstandings and wastage of time. If the responsibility of requirement analysis and testing is shifted on developer, it may overload the work of the developer causing lack of quality in process and product. Testing is the soul of the quality. If the developer is testing his own code then at times he may not be able to identify the errors. Developers may be aware of designing but might be less aware of quality standards. Agile methods are based on the concept of incremental, adaptive to change and self- organization i.e. the development team can organize them and can take decisions independently. But in some situation, leadership is required because self organization can lead to conflicts when the requirements get complex or the system gets complex. Hence the proposed solution is to redefine developers’ role and activities in the agile development process to ensure the overall good quality of the product. Various techniques like refactoring, on-site customer etc helps in improving the quality of the product. But there is still a need for Quality Analyst in the agile methodologies. The proposed solution is to introduce the role of Quality Analyst in agile methods and to redefine the roles and activities of the developer. It is proposed that the development team should be divided into groups and then there should be one quality analyst for each group. This quality analyst will not play the role of developer but as the monitoring authority of teams over all the work. It should be the responsibility of the Quality analyst to interact with the customer and during this continuous interaction he should gather all the requirement information and then must explain these requirements to the developer. Instead of educating the customer it is better to utilize expertise of those people who have abilities to interpret customer need to be implemented technically. In situation where the customer does not possess technical knowledge, the presence of quality analyst can be of great help. Documentation has been the critical issue among the conventional and agile methodologies. Agile development is not against documentation but it encourages comprehensive documentation in order to save time and resources. But in some situations when customers demand or software is complex, documentation needs to be extensive. Hence in the proposed approach the quality analyst is supposed to perform this task only within their development teams. This may avoid the extra work load on developer. Interaction between the quality analysts of different development teams is also an important factor. Development teams must interact with each other through the quality analyst via daily meetings of short durations. These quality analysts must maintain their mutual interaction in order to measure the progress, discuss critical issues, and share knowledge and their resources within the project. The conflicts arising in the development team can be solved by the management. The development teams are allowed to make their own decisions but major decisions relating to the project will be taken by the management. The proposed model consists of the customer, quality analyst, developers and the top management. There should be a good communication between the customer and the quality analyst. The quality analyst should transform the requirement information into technical details and then he should send them to the developers. 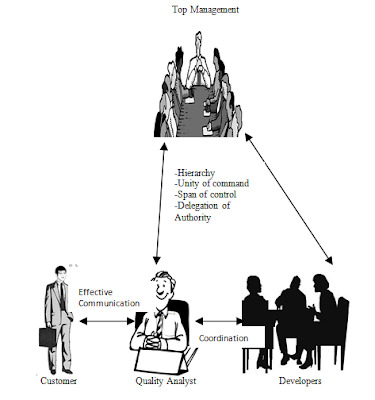 There should be good coordination between the quality analyst and the developing team. Coordination is basically synchronization of the efforts. It is the orderly arrangement of group effort to provide unity of action in the pursuit of a common purpose. The quality analyst will help in the documentation, testing and maintaining other quality standards. The proposed model also suggests a hierarchical system i.e. management at the top and developers and the quality analyst at the bottom. Basically the management will take major decisions about the project. Management is also responsible for removing the conflicts arising in the development team. Another important advantage of hierarchy is that it acts as an instrument of integration and coherence in the organization. Unity of command means that an employee should receive orders from one superior only. It means that the management team, as a whole would come to one single decision and then that decision is passed to the developers. Depending on the type of project, span of control is decided. Span of control means the number of sub-ordinates or the units of work that a manager can personally direct, control and supervise. If the project is routine types then the span of control is large else small. In hierarchical systems, delegation of power also takes place. Delegation means conferring of specified authority by a higher to a lower authority. Here the developing teams have delegated power of taking their own decisions within their teams. Delegation can be permanent or temporary. The main advantage of using this is to increase the sense of responsibility and interests in the developers.